The World Kennel Organization is a world organization for cynology and dog sports. It currently has 22 member and / or partner countries (only one national association is permitted per country), which has its own breeding book, or whose member associations exhibit ancestor boards, and train international breeders, breeders and breeders. There are five sections: Europe, North and South America including the Caribbean, Asia and the Pacific, the Middle East and Africa in the World Kennel Organization. 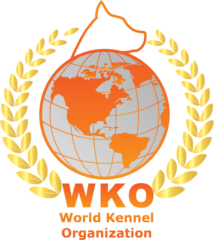 The World Kennel Organization (WKO) guarantees within its organization the mutual recognition of the pedigrees of the national associations as well as their judges. The WKO maintains a studbook for individual members, which is open only to members in whose home country the member has his principal place of residence, no national organization is a member of the WKO, or whose national association does not have a studbook. At present the WKO recognizes 411 different breeds. The countries of origin, in cooperation with the standard Commission of the WKO, establish the standards for their breeds (description of the ideal type of the breed). Breeds whose countries of origin are not represented are administered by the WKO in the patronage. At all exhibitions of the WKO or their member associations, the racist standards for the judges constitute the basis for evaluation. The standards are also the basis for the breeders to breed within the World Kennel Organization a racial, healthy and first class dog. The WKO and its member countries conduct international beauty exhibitions and performance audits, the results of which are reported to the WKO General Office and recorded digitally by the WKO General Office. If a dog has reached the required number of entitlements, he can be awarded the title of an international beauty, exhibition, work or work and beauty and beauty show. These titles are awarded by the WKO. In addition, the breeders – through their national associations – can have their kennels protected internationally.